This article is reprinted from the website Death of a Million Trees with permission and minor changes. Seven years ago, most of Oyster Bay was acres of non-native annual grasses. Since then, most of those acres of grassland have been plowed up and are in various stages of being planted with (one species?) of native bunch grass (purple needle grass?). 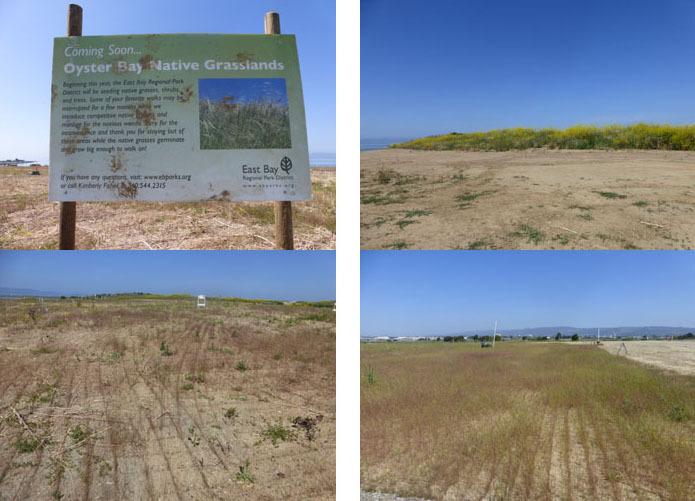 We wish EBRPD good luck in this effort to convert acres of non-native annual grass into native bunch grass. Frankly, it looks like a lot of public money down the drain to us. It also looks like an excuse to use a lot of herbicide. 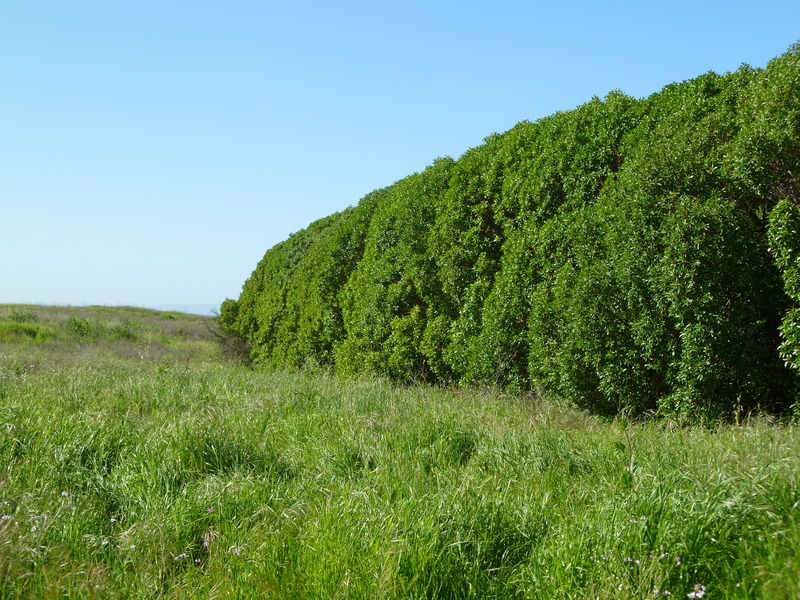 Pittosporum forest was an excellent visual screen, sound barrier, and wind break. It was healthy and well-suited to the conditions on this site. It was probably home to many animals. 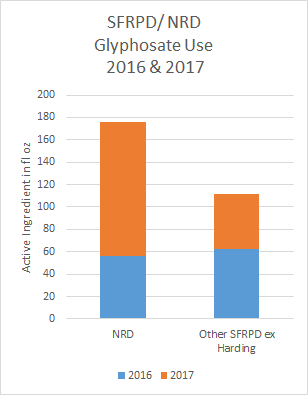 We have recently analyzed the data for herbicide use in the full year 2017 for San Francisco’s so-called “Natural Resources Department” (NRD – formerly Natural Areas Program). It’s up 57% from the previous year. But this year, it’s up again, almost to 2015 levels. 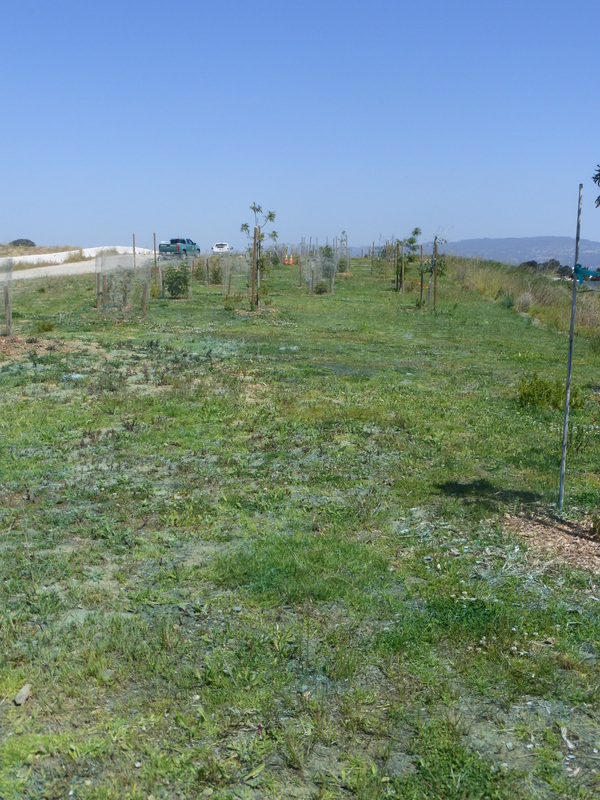 We have been hoping that SFRPD is working to eliminate all Tier I and Tier II herbicides, with leadership from the Department of the Environment (SF Environment). 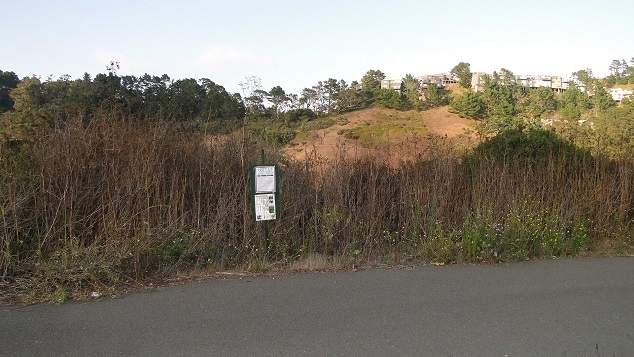 For the rest of SFRPD (excluding Harding Golf Course, which is managed under a PGA contract), they have actually reduced usage. They use a greater variety of herbicides than NRD, of which more later. But they are using less – across all their parks and golf courses – than the NRD is. NRD forms a quarter of the area of SFRPD. WHAT’S WRONG WITH THESE HERBICIDES? These hazard rankings can change: Roundup/ Aquamaster (glyphosate) was reclassified from Tier II to Tier I when the World Health Organization found it was a probable human carcinogen. Milestone (Aminopyralid) was reclassified from Tier I to Tier II, despite the fact that it is extremely persistent and mobile in the environment. As you research these herbicides, you may find – as we did – that much of the research originates with the companies that produce them. It may be unbiased, but the evidence is that it often is not. So we looked for other sources, which are easier to find for well-established herbicides like glyphosate (Roundup or Aquamaster). It doesn’t mean the others are innocuous. Carcinogenic. In April 2015, the World Health Organization determined glyphosate was a “probably carcinogenic.” EPA scientist Dr Marion Copley sent a letter before her death saying it was essentially certain that glyphosate causes cancer. She also said that as a chelater, it was likely an endocrine disruptor. Associated with birth defects. It’s been associated with birth-defects, especially around the head, brain and neural tube — defects like microcephaly (tiny head); microphthalmia (tiny undeveloped eyes); impairment of hindbrain development; cyclopia (also called cyclocephaly – a single eye in the middle of the forehead). Bad for the soil. Research indicates it kills beneficial soil fungi while allowing dangerous ones to grow. It binds to the soil, and acts as a “chelating agent” – trapping elements like magnesium that plants need to grow and thus impoverishing the soil. Bad for other living things. It’s very dangerous to frogs and other amphibians, and quite dangerous to fish. Garlon is even more hazardous than Roundup. It’s been classified as Tier I for at least as as long as we have been monitoring pesticide use in San Francisco. Garlon can persist for up to two years in dead vegetation . The NRD uses Garlon extensively against oxalis. 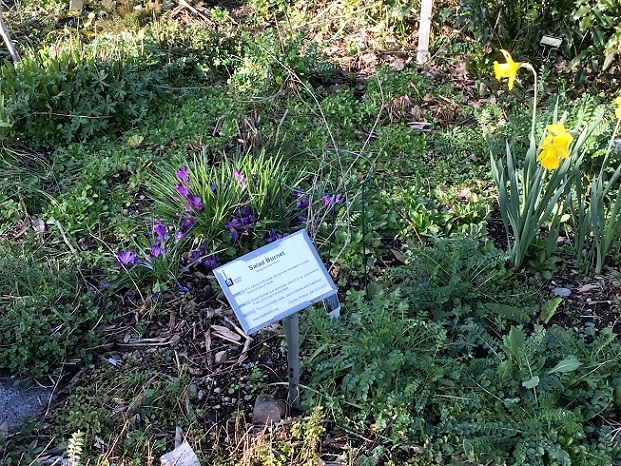 If it terminated its war on oxalis, it could stop using Garlon altogether. This is a relatively new pesticide, and not much is known about it — except that it’s very persistent. In Sweden, it was found in the soil 8 years after a single application. It not only doesn’t degrade, some plants excrete it through their roots so it travels through the environment. It’s prohibited in the European Union countries, since 2002; and in Norway since December 2001 because of groundwater concerns. 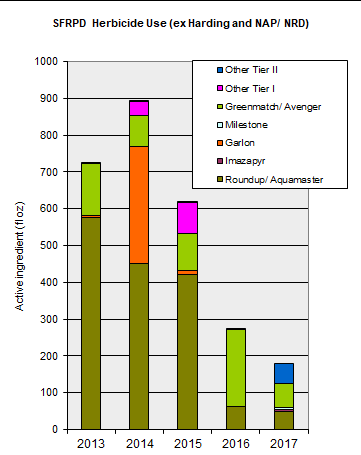 Milestone is a Dow product that kills broadleaf plants while ignoring most grasses. This is even more problematically persistent than Imazapyr; a computer search yielded warnings of poisoned compost. It seems that this chemical is so persistent that if it’s sprayed on plants, and animals eat those plants, it still doesn’t break down. They excrete the stuff in their droppings. If those are composted — it still doesn’t break down the chemical. So now the compost’s got weedkiller in it, and it doesn’t nourish the plants fertilized with the compost, it kills them. The manufacturer sees this as a benefit. “Because of its residual activity, control can last all season long, or into the season after application on certain weed species,” says the Dow AgroSciences FAQ sheet. Nevertheless, after an outcry and problems, Dow AgroSciences stopped selling Milestone in the UK for a number of years. It’s also prohibited for use in New York. With endocrine disruptors, the old theory “the dose makes the poison” doesn’t work. They are potent at very low levels. These are parks that we visit with our families, including kids and pets. Kids are particularly vulnerable to pesticides because of their low body weight and rapid growth. These are the watersheds that feed chemicals into our groundwater (which is also now being added to our domestic water supply). 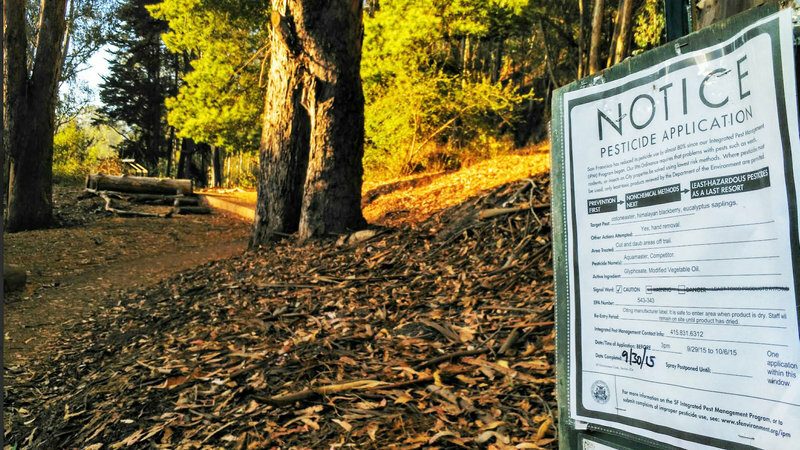 The San Francisco Forest Alliance stands for No Pesticides in our Parks. 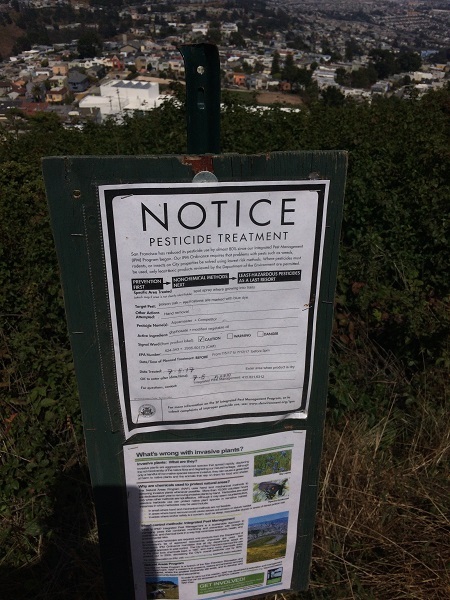 One of our supporters has been pursuing a concerning issue regarding pesticide application in San Francisco. 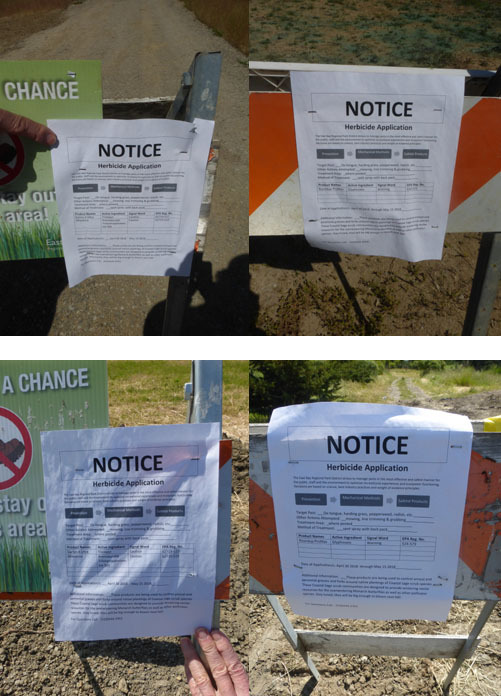 As our regular readers will know, proper notices are required when spraying toxic herbicides (designated Tier II, More Hazardous and Tier I, Most Hazardous) on city property – including our parks. 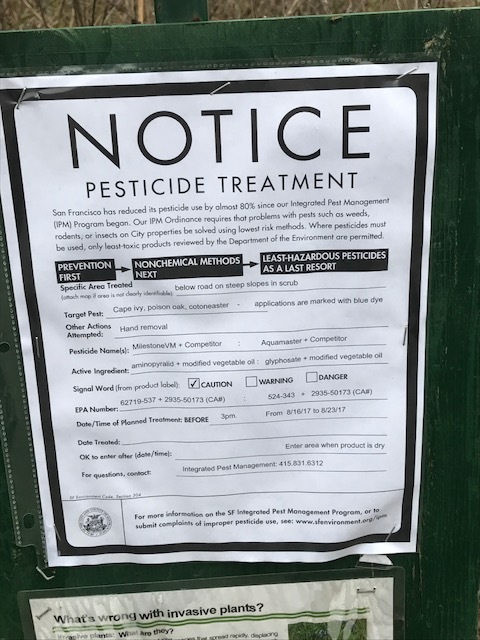 Recently, SF Environment made changes to its application guidelines to provide better protection to the public, and to workers applying the pesticides. 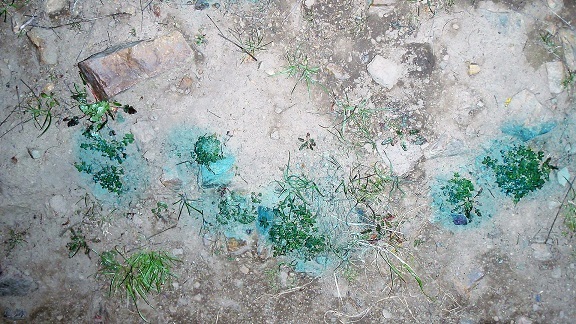 This requirement includes adding a blue dye to the mix so the public can see what has been sprayed with these chemicals. However, there’s a loophole. Neither notices nor dye are required if the area is “inaccessible to the public.” As the Natural Resources Department (renamed from NAP, the Natural Areas Program) works to limit public access to only a few “maintained trails” we’re concerned that this will give SF Recreation and Parks a free pass to use toxic herbicides like glyphosate (Roundup) without notices or dye. So concerned citizen Tom Borden gathered information under the Sunshine Act. His research culminated in this letter to the Commissioners for the Environment. However, the IPM Compliance checklist says something very different, “Posting is not required for areas inaccessible to the public.” This “publicly inaccessible” exception violates the Code and puts City workers and the public at risk. According to IPM staff, they leave it up to individual departments to decide which areas are “publicly inaccessible”. IPM staff have stated they do not make it their business to monitor these designations. This clearly puts City employees at risk of unwitting exposure to pesticides. It also puts the public at risk as land managers are left to their own devices to decide which areas qualify as “publicly inaccessible”. This posting loophole is not necessary under the precautionary principle and it violates the law. It opens the City to lawsuits from employees who were not provided the protections the law promises. I hope you will have the Department to rectify this. See the email exchange below for additional information.. This is a Sunshine request. San Francisco Environment Code Section 304. (e) allows the Department of Environment to grant permanent (ongoing as opposed to one time) exemptions to the notification requirements of the code. 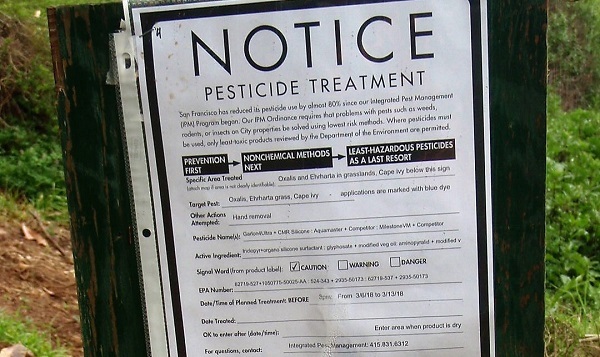 (e) The Department may grant exemptions to the notification requirements for one-time pesticide uses and may authorize “permanent” changes in the way City departments notify the public about pesticide use in specific circumstances, upon a “finding” that good cause exists to allow an exemption to the notification requirements. Prior to granting an exemption pursuant to this subsection, the City department requesting the exemption shall identify the specific situations in which it is not possible to comply with the notification requirements and propose alternative notification procedures. The Department shall review and approve the alternative notification procedures. Please provide a list of all “permanent” exemptions that have been granted in the last 10 years. If any have been granted to the Recreation and Parks Department or the SFPUC, please provide copies of those “findings” and a copy of the exemption request from the department. 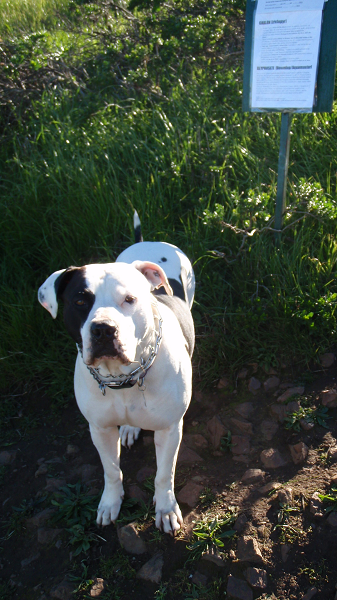 He got a response – a phone call with Chris Geiger, responsible for San Francisco’s Integrated Pest Management program. Chris performs a delicate balancing act between reducing pesticide use and dealing with land managers who want to use these chemical weapons against “invasive” plants. Tom asked for confirmation of the discussion in writing. He got it from Anthony Valdez, Commission Secretary. 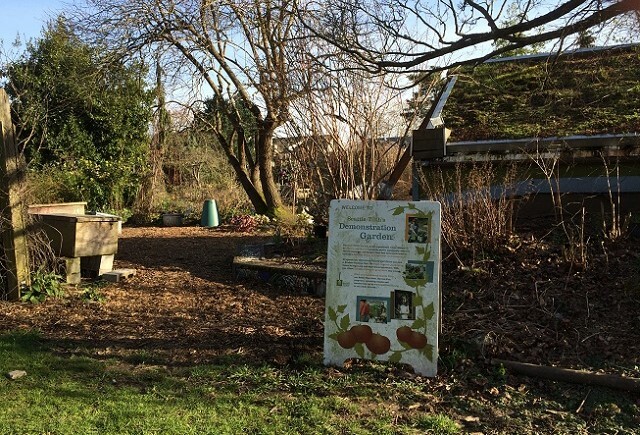 As Chris Geiger discussed with you – the Department of the Environment has not granted any permanent exemptions to the posting requirements of Environment Code Section 304(a) for publicly accessible parcels. We do allow variances from the posting requirements for some publicly inaccessible parcels, most notably certain areas of San Francisco International Airport and closed utility rights-of-way managed by the Public Utilities Commission. Are any areas managed by the Recreation and Parks Department considered “publicly inaccessible parcels”? If so, please provide a list of those areas and the associated variances from the posting requirements. The Department of the Environment does not review individual parcels to determine if they qualify as “publicly inaccessible.” That determination is left to the individual departments, including the Dept. of Recreation and Parks. We therefore do not have any specific variances or exemptions on file. The reference document for this policy is the IPM Compliance Checklist. You mentioned on the phone that you want to ascertain whether park areas adjacent to trails might be considered “publicly inaccessible” if there were signage requiring users to stay on the trail. The answer is no. The posting exemption for publicly inaccessible areas is meant to apply to work areas, such as the Rec & Park Corporation Yard, not to public parks. We have never and would not ever grant any posting exemption for this kind of situation, and in my tenure we have never had any discussions or written exchanges with the Dept. of Recreation & Parks where this question has even come up. In my experience, Recreation & Parks has been quite careful and responsible in complying with posting requirements. It’s good to know all herbicide applications in regular parkland and Natural Areas will be posted and that blue marking dye will be used. On a related topic, Aquamaster was sprayed on Mt Davidson on July 5 . 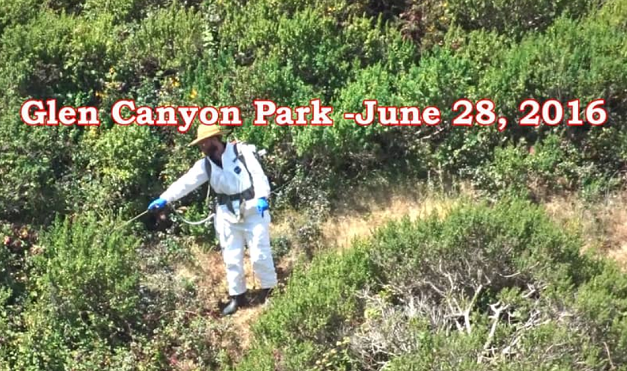 The treatment was to control poison oak growing onto a primary trail. The herbicide was sprayed on PO and grass that was literally on the trail edge. 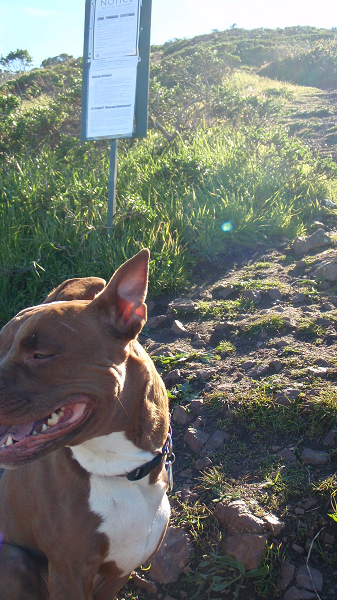 The trail was not closed off as required. 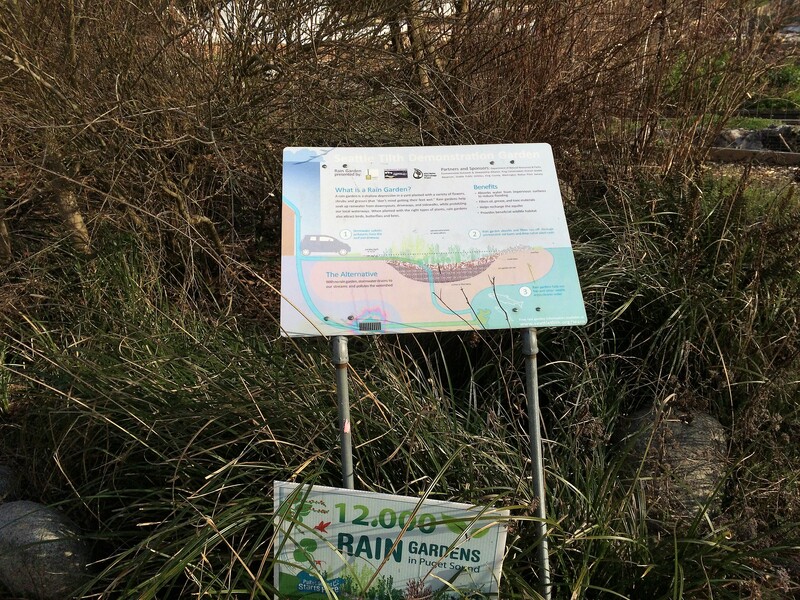 Attached are photos of the sign and the application area. More training and better supervision needed? He followed up with another email. I see the Compliance Checklist does say, “Posting is not required for areas inaccessible to the public.” However, the actual law, SF Environment Code Chapter 3, does not make any such exception. The posting exception in the Checklist violates the language of the Environment Code. How does the Department of Environment justify making this exception? Chapter 3 is meant to protect everyone in the City. The IPM Compliance Checklist note removes this protection for City employees. Doesn’t this leave the City open to lawsuits by willfully removing protections the law promises City employees? 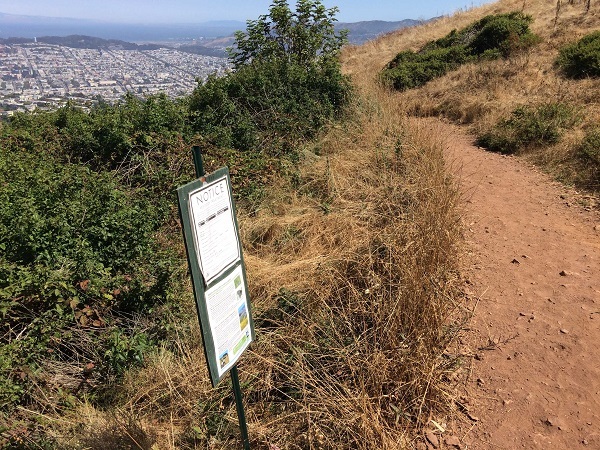 As you know, I am concerned the RPD will use this as a loophole to avoid posting requirements in Natural Areas since their position is that the public is prohibited from straying off trail into those areas. You state above that your department will not provide oversight of the “publicly inaccessible” designations made by City land managers. This leaves in doubt what really qualifies as publicly inaccessible and as a result, leaves the public open to exposure to herbicide applications that are not posted or marked with blue dye. I appreciate that your email also makes assurances that you have not granted RPD any additional posting exceptions, beyond this one granted to all City departments. After that, there was the letter to the Commissioners to express the same concerns. Thanks, Tom, for trying to protect everyone from toxic herbicides in our parks! 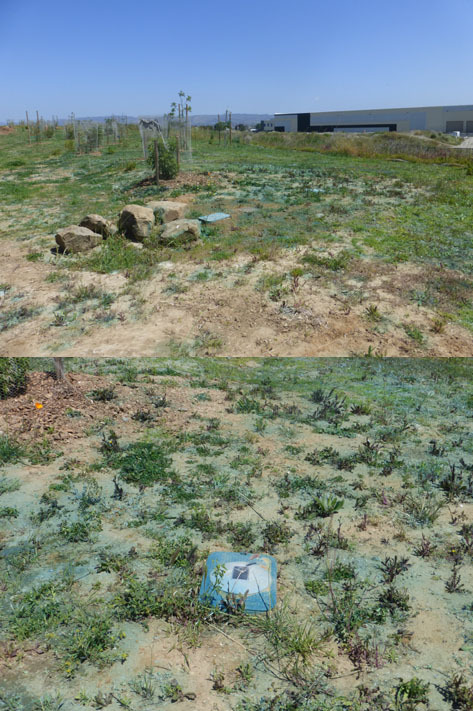 It warned they would use Aquamaster (glyphosate) and Milestone (an astonishingly persistent herbicide) on the hillside above Islais Creek. SF RPD should stop all use of Tier I chemicals. 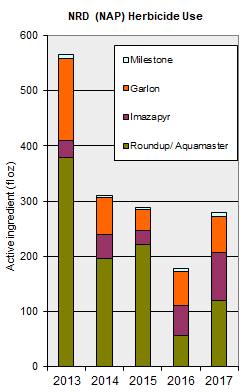 (Currently, the Natural Resouces Division uses Garlon and Roundup that are Tier I. ) The benefits are not worth the risk – to the public, their pets, and the people who apply herbicides. 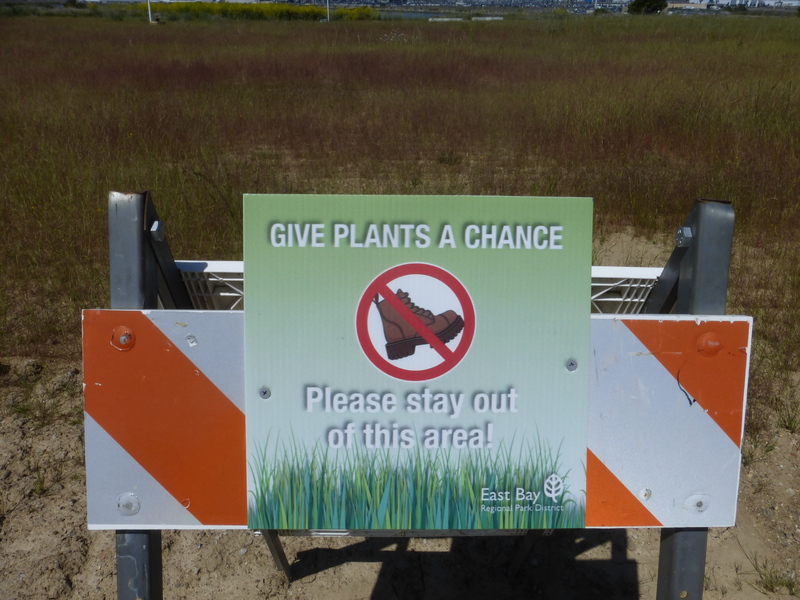 We call on SF Rec and Park to stop using herbicides in our parks. New evidence has emerged that Monsanto influenced the Environmental Protection Agency (EPA) to downplay the cancer-causing risk of Roundup. This pesticide, and others that may be even more hazardous, are used in our parks and watersheds. And now, since San Francisco is adding ground water to the Hetch Hetchy water we have been getting, our water may contain traces of these hazardous chemicals. Bloomberg and other news sources show that Monsanto offered to ghost-write sections of the EPA report on glyphosate, and sought the help of an EPA official to kill the reports that glyphosate is a probable carcinogen. We reported earlier that a letter by an EPA employee Dr Marion Copley, written as she was dying, says: “It is essentially certain that glyphosate causes cancer.” She also said it is an endocrine disruptor, and alleged corruption within the EPA. 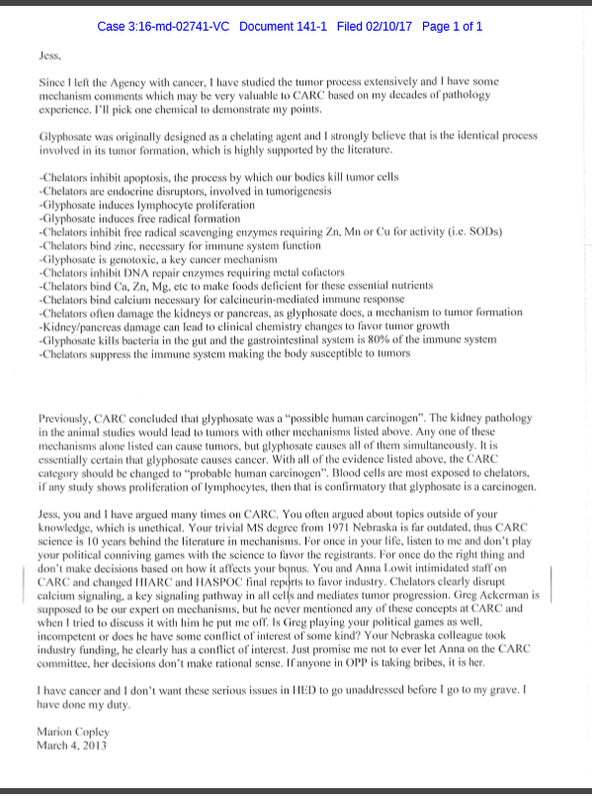 Dr Copley’s letter only used glyphosate (Roundup, Aquamaster) as an example. The letter hinted that other chemicals might have fared similarly – that is, not been properly evaluated because of corporate influence on EPA employees. We the public cannot assume that toxicology tests performed by the companies producing the pesticides or scientists they may pressure are sufficient to prove the chemicals are harmless. 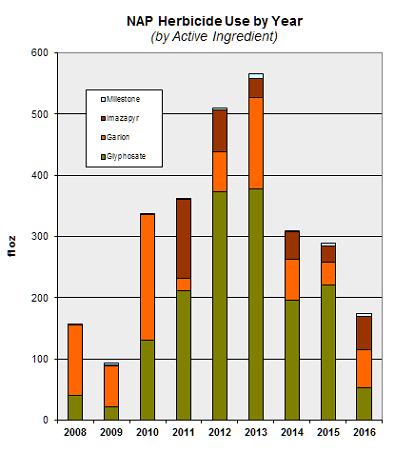 In the bar-graph here, the green section represents Roundup. The Natural Resources Department (NRD) increased its use of Roundup each year from 2009 to 2013, then decreased it in 2014, slightly increased it in 2015, and now has brought it down to below 2010 levels – though not as low as in 2009 or 2010. Nowadays, Garlon in San Francisco is used only by the Natural Resources Department against Bermuda buttercups (oxalis). But – starting 2017, SF Environment is going to approve the use of something new: Milestone VM Plus. It’s a mix of Garlon and Milestone VM (aminopyralid). This combination is being approved as a Tier II herbicide. 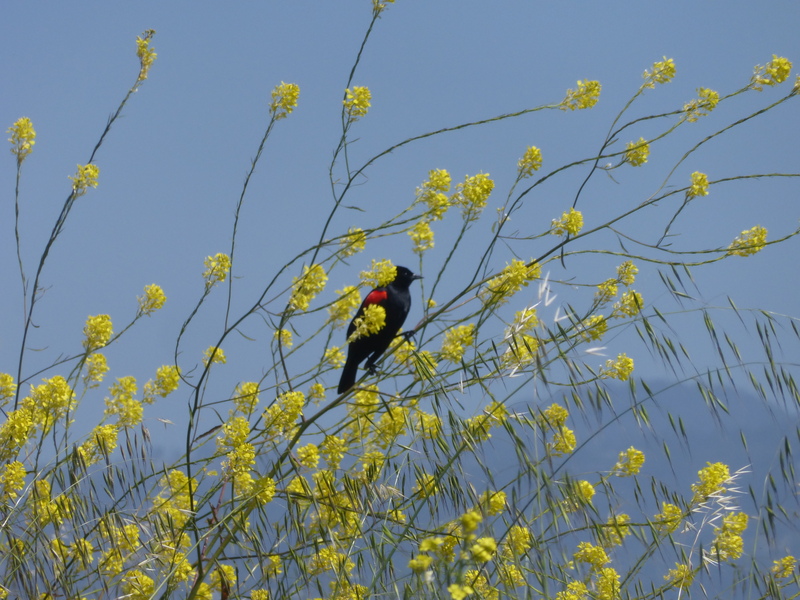 Amino-pyralid is the pesticide so persistent that it lasts for years – and if an animal eats treated vegetation, its droppings become toxic too. 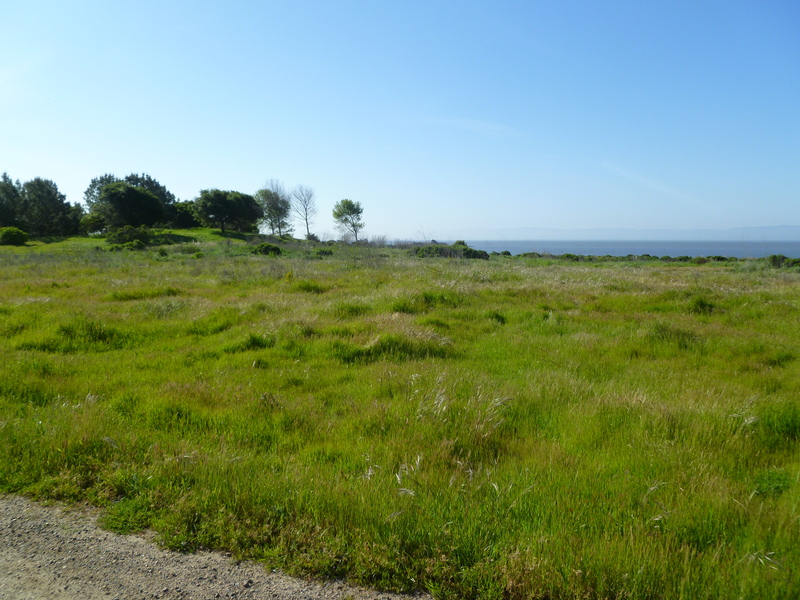 It was considered a Tier I pesticide until SF Environment decided to reclassify it as Tier II in 2013. It’s banned in New York and effectively in a number of other states too. We are dismayed that a new triclopyr-based pesticide is being added to the 2017 pesticide list, and in combination with aminopyralid – and that too as Tier II. This is at a time when we’re working to *remove* triclopyr (as Garlon) from the list. We refer to Milestone VM Plus, which is Aminopyralid, triisopropanolamine salt, 2%; Triclopyr, triethylamine salt, 16%. It’s for injection and for tree stumps. As we understand it, this is a mixture of Garlon 3 and Milestone. This could be disastrous. Triclopyr is one of the most toxic herbicides still on the list. And Milestone VM (Aminopyralid) is uncannily persistent – it can last for years. 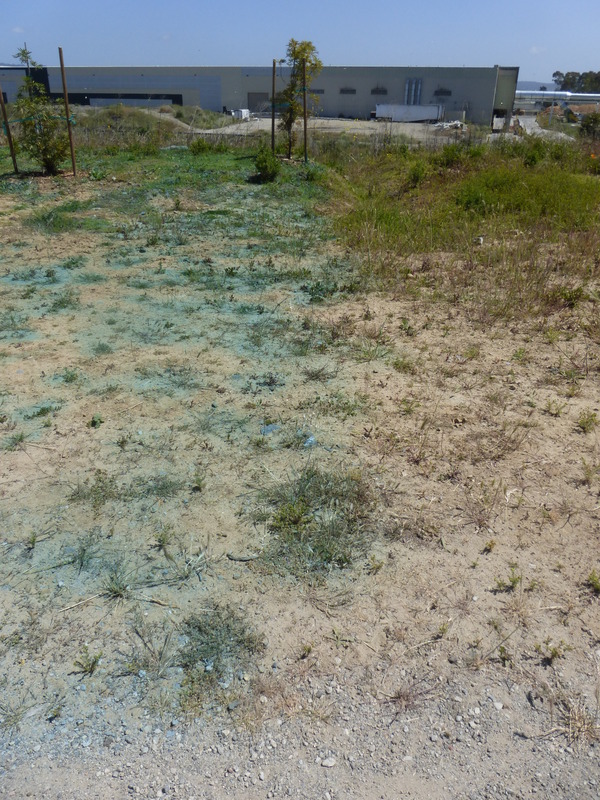 If vegetation treated with it is eaten by animals and excreted, the excreta still contains enough herbicide to harm plants. Until 2013, Milestone was considered a Tier I chemical for its persistence – and then changed to Tier II (possibly at the request of the Natural Resources Department, since other SFRPD departments don’t use Milestone VM.) If Milestone VM Plus is used on trees in a forest or stand of trees, it could weaken adjacent healthy trees through the intergrafted root network, thus destabilizing groups of trees. We urge you to delete Milestone VM Plus from your restricted list. It’s no better than using Garlon with some added Milestone. If it must be retained, please classify it as Tier I. This year, San Francisco started adding well water drawn from under the city to our tap water. Roundup or Aquamaster (glyphosate) and other pesticides such as Garlon (triclopyr), Milestone (aminopyralid), and Stalker (imazapyr) – and their breakdown products, some of which may be even more toxic – could well be contaminating our water supply. Herbicides (and other chemicals) could interact in ways that are unpredictable. No one has researched them. There’s no way of knowing how much the cumulative exposure is for any individual. This is particularly a concern for children, whose low body weight and fast growth make them especially vulnerable; and for people with illnesses or chemical sensitivities. Importantly, if they are endocrine disruptors – which means they act like hormones in the human body – tiny amounts can have a disproportionate impact. It’s an exception to the “dose makes the poison” saying. Here’s an article that cites references to studies showing endocrine disruption from glyphosate: Why Low Dose Pesticides are Still Hazards. 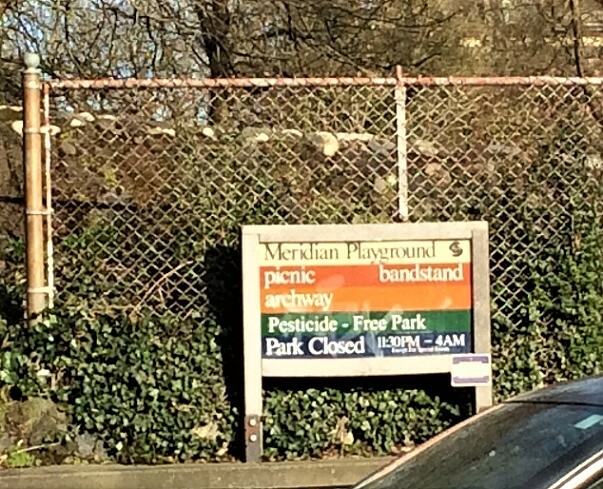 While the San Francisco Forest Alliance asks for no pesticides in our parks (and watersheds), San Francisco could make a start by converting parks with children’s play areas to Pesticide-Free Parks. Here’s an example from Seattle. 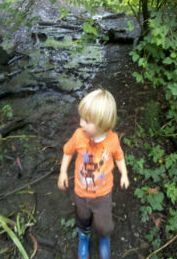 Opponents of restricting pesticide use in this way might fear that the park looks awful, so we went and had a look. It was a sunny afternoon, and the park was beautiful. The park was full of kids of all ages, from babies and toddlers to teenagers. One man rocked his tiny pink-clad baby daughter. Another dad brought his small son to kick a ball around in the grass. School age kids chased each other with squirt-guns. Some families brought their dogs, who are allowed in the park. It must be a relief to know that you can safely take your family to such a park, and not encounter Roundup or Garlon, Stalker or Milestone VM. The park has a nice playground. 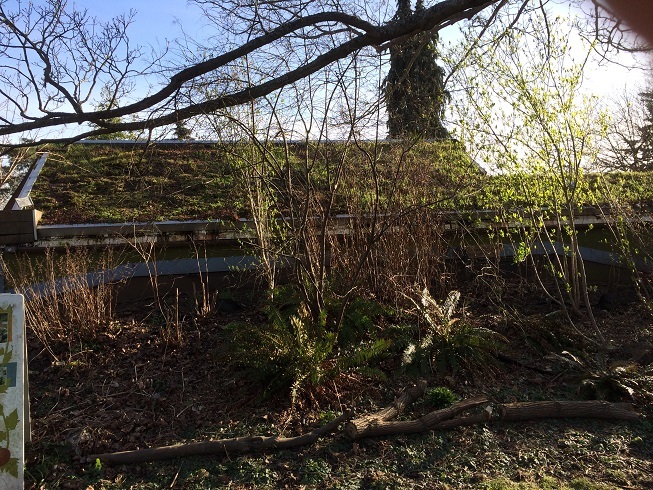 … complete with a green roof. 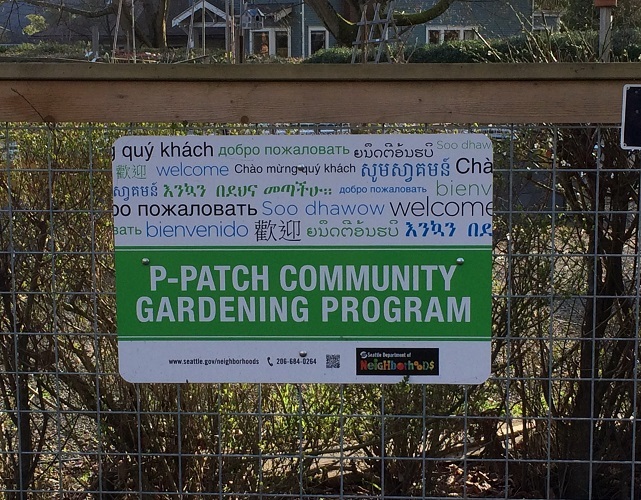 And a multilingual welcome sign. It was a lovely example of the kind of Inclusive Environmentalism that San Francisco Forest Alliance stands for.